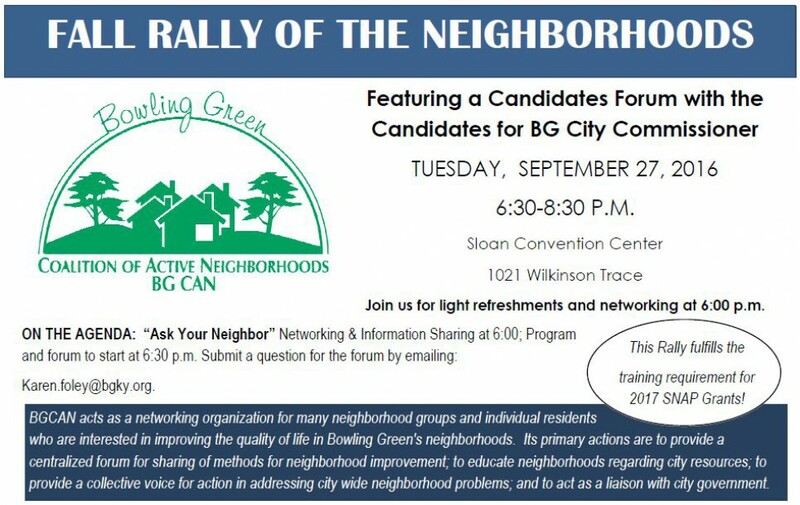 BGCAN will host its Fall Rally of the Neighborhoods and City Commissioner Candidates Forum on neighborhood concerns at the Sloan Convention Center on Tuesday evening, Sept. 27. The Bowling Green Coalition of Active Neighborhoods (BGCAN) will host a candidates’ forum featuring the candidates for Bowling Green City Commissioner at the BGCAN Fall Rally of the Neighborhoods on Tuesday, September 27. The event will take place in one of the ballrooms at Sloan Convention Center, 1021 Wilkinson Trace. The Rally will begin with light refreshments and networking at 6:00 p.m., with the program scheduled to start at 6:30. BGCAN is an umbrella organization for the City’s various neighborhood organizations, uniting neighbors from across the City to provide a centralized forum and collective voice for neighborhood improvement. To submit a question for the forum, please email: karen.foley@bgky.org. Attendance at this event also fulfills the training requirement for eligibility the City's grant program for neighborhoods.